Five-year-old Huynh was born in a small village in Vietnam with a condition known as congenital hairy nevus. It is a type of large mole, and for many with the condition, including Huynh, it has coarse hair growing out of it. Although most hairy nevi are benign, they can occasionally turn into malignant melanoma. We first met Huynh in 2013 on one of our surgical team trips to Phan Rang, Vietnam. At that time, the nevus extended from her neck up to her forehead, including over her eyelid. When she was five months old, Huynh’s father abandoned her. Her mother, Hien, left school after the ninth grade and could not find work in their small town, so her only choice was to move eight hours away to Saigon to look for employment. She currently works in a shoe factory but doesn’t receive any vacation time, so the only time she can see her daughter is during the Vietnamese New Year when the shoe factory closes for the holiday. Huynh lives with her grandmother and is in kindergarten now. The other children used to tease her, called her “ugly face” because of her condition, and would not play with her. But because of the work of our surgical teams, the bullying has subsided. Hien says that after last year’s operation, the children in their community stopped teasing Huynh. Because her hairy nevus covered such a large area, it had to be removed in sections. In 2013, our team performed a procedure to remove part of the nevus from her lower left cheek and placed a skin graft over the area, which took well. In 2014, the team removed the nevus from her upper lip, nose and left cheek area. 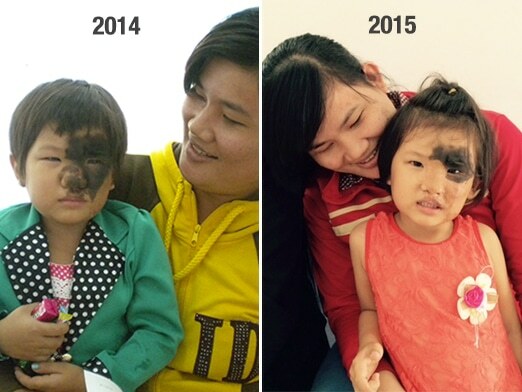 And in January 2015, Hien brought her daughter back to the hospital where the team removed a section on her forehead. She only needs one more operation to remove the nevus from the areas on and around her eye. The impact of reconstructive surgery is truly transformative. Huynh now has the chance to lead a life free of stigma and rejection because of the work of our surgical teams. Huynh’s mother doesn’t yet know when she and her daughter will be together again permanently. She says her focus right now is on saving money to provide a good future for her daughter. “My hope is that Huynh has a better life than me,” she says. Hien is happy and hopeful that once her treatment is complete, Huynh will be completely spared the danger of skin disease and will be able to grow up without psychological pain or stigma.